But attempts to prove it was are interesting feats of selective partisan history. There is little need to repeat the official history of the monument here. The fact that it was built in the city of Agra in the 17th century under the orders of the Mughal Emperor Shah Jahan as a mausoleum to his deceased favorite wife Arjumand Banu Begum (Mumtaz Mahal) is well-known and it is easy to stumble upon. Cast a few glances on the Taj Mahal and you are sure to see the touches of Islamic art. To be sure, hardly anybody in India questions this and the monument is vastly popular among not only foreign but Indian tourists as well. Thus, I stress the fact that I will mostly speak of “fringe” elements here whose views should not be generalized. Prominent among these was Purushottam Nagesh Oak, a prolific author who left a string of books in Hindi as his legacy. The Agra Red Fort was a Hindu Palace, The Fatehpur Sikri is a Hindu City, The Lucknow Imambaras Are Hindu Temples – these are just some of Oak’s work. The direction is clear: name a prominent building commissioned by Muslim rulers of northern India and Oak would tell you it was originally a work of Hindu architecture. But Oak did not stop there; in another text he claimed that even the Kaaba in Mecca was a Hindu temple. Among his works, Oak became perhaps best known for the two books he wrote on the Taj Mahal and – it’s no surprise by now – in both of them the writer claimed that this work of Islamic architecture was a Hindu temple. The latter of these books — Tajmahal mandir bhavan hai (“The Taj Mahal is a temple building”) — has been living on my bookshelf for years. The recent endeavors of Hindu nationalists seem a good (or rather, bad) occasion to dust off Oak’s publication and throw some of his juiciest thoughts and quotes into the ring. But, in order not engender any confusion, I will start with what is accepted by the mainstream historians whom Oak detested so much. Pieces of wood, iron, and stone may themselves have no religion or culture, but those who shape these materials into art and architecture do. The Taj Mahal is clearly of Timurid architecture, having been built by the Mughals, a dynasty whose origins start with Babur, claimed to be a descendant of both Timur (Tamerlane) and Genghis Khan. Babur was born in what is now Uzbekistan and eventually embarked on conquests that ended in northern India. At the first glance, the much older tomb of Timur in Samarkand and the Taj Mahal in Agra may not resemble each other so much, but the similarities in layout and thought are there. The great Mughal mausoleums of northern India are much more sophisticated and enhanced edifices building upon earlier concepts visible in Central Asian Timurid architecture. And, as the Taj Mahal had been built by an emperor raised in Islamic tradition in the memory of his wife (who was of the same faith) and its body incorporated the elements of Islamic religion and rules of Islamic arts (such as quotes from the Quran and the lack of graphic representation of people, God, and Muhammad), there is no doubt that the monument can be called a work of Islamic architecture. Finally, the Taj Mahal complex includes a mosque and regular Friday prayers are held there (remember, dear tourists – that’s why you can’t visit it on Fridays). Once again, to be absolutely clear: most Indians are perfectly all right with this order of historical facts. A shortcut in thinking may easily lead us from perceiving it as a “building of Islamic architecture” to an “Islamic building.” This is where a segment of Hindu nationalists get off the tour bus. Hindu nationalists tend to believe that India was already in its era of glory before the first invasions of people professing Islam took place. In this view, the illustrious Golden Era of “Hindu rule” was overshadowed by the dark period of “Muslim rule.” Even a clear division of Indian history between a “Hindu era” and a “Muslim era” is so superficial (and colonial) that a whole essay would be needed to counter this image (but such essays have already been written). However, Hindu nationalists not only talk of a “Muslim era” but describe it as a time of razing, looting, religious persecution, or forced conversions. While there is no denying that certain Indian Muslim rulers hurt Hindus in a number of ways, focusing only on this aspect is still a selective use of facts, to say the least. But here the Taj Mahal emerges as a problem in the narrative. It appears right in the middle of the “Muslim era” but it is no slaughterhouse or madrassa, and it is immensely beautiful and vastly popular. If Hindu nationalists want to claim that the Muslim rulers were generally bad for India, what can they do with the Taj Mahal, India’s biggest trademark worldwide and a huge source of income? The easiest and safest way is to ignore it. There is no secure way to debate the Taj Mahal and not address its religious overtones on one hand, and to face the question of its value for India on the other (even the sheer material value, if all others would be ignored). Thus, some history textbooks published by Hindu nationalists in Hindi simply choose to omit the Taj Mahal, and, indeed, most of Islamic architecture. The period of “Muslim rule” is a tale of invasions and resistance – the rest is silence. On the political level, Hindu nationalists were careful enough not to attempt a public campaign against the Taj Mahal. Thus, it must be said that Oak’s claims of the building being originally a Hindu temple were largely ignored even by Hindu nationalists. Yet, certain controversies were not avoided. In 2014, the Hindu nationalists of the Bharatiya Janata Party (BJP) and of the Rashtriya Swayamsevak Sangh (RSS) organization — and that often means the same people in a double role — won the general elections and took over central power in India. To my knowledge, the BJP’s prime minister, Narendra Modi, did not say anything controversial about Mumtaz Mahal’s mausoleum. In 2017, the same party – the BJP – won elections in the state of Uttar Pradesh, where the Taj Mahal is located. In March 2017, the position of Uttar Pradesh’s chief minister was taken over by Yogi Adityanath. A Hindu nationalist and a priest of a famous temple in Gorakhpur, Adityanath can be categorized as a hawk even by the standards of the Hindu nationalist milieu. 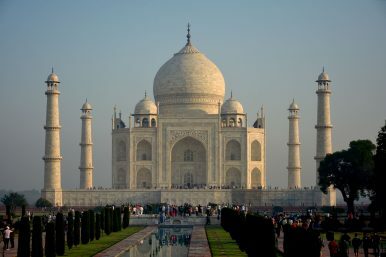 In the months after Adityanath took over, there appeared rumors that the Taj Mahal had started to disappear from some Uttar Pradesh government publications, including the ones on tourism and on cultural heritage policy. As the news spread through the media, BJP politicians could no longer retain their “silence strategy” on the Taj Mahal and reacted in ways which only added fuel to the fire. It is interesting to note that the three statements which made most of the headlines represented three different approaches to the issue, showing how difficult it is for the Hindu nationalists to wrestle with the Taj Mahal’s fame. Thus, Som chose what could be called a “responsibility narrative” – if the monument’s founder was a bad ruler, then it is as if the monument shares in the blame and should be erased from history along with the founder. It is not necessary to go into why Taj Mahal was built, who built it, and for what purpose… What is important is that Taj Mahal was built by the blood and sweat of India’s laborers and sons. Let me leave aside the rather strange opinion that the historical background of a historical building is unimportant. Apart from this, it may be said that Adityanath chose an “anonymous laborer narrative” – let’s not talk about the ruler who gave the order, but about the physical workers who constructed the monument. We do not know much about the laborers, but of course the majority had to be Indians so the monument is Indian by that measure – and the rest is silence. Thus, Katiyar chose the “takeover narrative” – the Taj Mahal belonged to us, the Hindus, and the Muslims snatched it away from us. This is exactly the point once raised by Oak and Katiyar even mentioned Oak as an authority on the subject. It is therefore high time for our hero to take the stage. Purushottam Nagesh Oak was of the opinion that the Taj Mahal had originally been a 12th century temple dedicated to the god Shiva and called “Tejomahalay” (Tajmahal mandir bhavan hai, p. 10; in the 2008 edition). The Mughal emperor Shah Jahan did not commission a completely new building, but rather had the temple taken over and converted to a mausoleum for his departed wife (p. 26). But what to make of Persian-language sources that directly state that the emperor ordered the monument to be built? Here Oak uses linguistic jugglery, claiming that the phrase “a foundation was laid” does not mean that the construction of a new building was started, it only meant that an order was given to collect building materials to start converting the temple into a mausoleum (p. 29). And, at any rate, the source was simply lying to prove that “Muslim emperors had [a] big building built” (p. 29). And how to prove the building’s older age? Why can’t a radiocarbon dating technique be used on the Taj Mahal? Oak asked (p. 17.). Well, that’s perhaps because such a method works on objects that contain organic matter and the monument is stone. What about the Taj Mahal’s striking resemblance to other monuments of Timurid and Islamic architecture? Here Oak had it easy: they were all “Hindu,” too. All other great Mughal mausoleums of northern India were also converted from Hindu temples (p. 29). The dome is not a feature of Islamic architecture – it is actually Hindu (p. 12). And even if the monuments of “Western Asia” are similar to the Taj Mahal, this is because “Hindu architecture” had influenced them, as this architecture used to be popular all over the world in ancient times (p. 12). There is no “Indo-Arabic” architecture – only “ancient Indian” architecture (p. 12). Oak was right on this last point: there is no “Indo-Arabic” architecture; it should be properly called Indo-Muslim architecture. Oak was seemingly confused geographically, mentioning “Western Asia” but not “Central Asia” and mentioning “Arabic” architecture although the Mughals were not Arabs. But since the entire world had been under the Hindu influence, why care about geography? It is useless to list all of Oak’s points. His book floods us with a sea of evidence but it is equally shallow in all places. There is, however, at least one more claim worth mentioning. Shah Jahan could not have had the monument built for Mumtaz Mahal, because, like all Mughal emperors, he kept “thousands” of courtesans in his palace. Why, then, would he favor one woman with a monument symbolizing his love (p. 11)? Here Oak contradicted himself, as elsewhere he does claim that the purpose of converting the temple to the mausoleum was Mumtaz Mahal’s death – if that was not so, then what is the Taj Mahal now? But what is more important to me is Oak’s vision of Shah Jahan’s attitude toward woman. It is common among Hindu nationalists to claim that the Muslim rulers were not only cruel and fanatical but also wanton. In this narrative, Shah Jahan could not have loved one woman so much — he must have been lustful like all the rest. This leads me to a final conclusion. The Taj Mahal is everything the Hindu nationalists do not want it to be. It is Islamic architecture and it is Indian at the same time. It is India’s most famous building and its international trademark, easily overshadowing any single Hindu temple when it comes to India’s global image. It is not built on the ruins of a Hindu temple or using materials from a Hindu temple (contrary to some other buildings) so you can’t “Hinduize” its past. It is a major tourist attraction but it has religious purposes as well, so you can’t “secularize” it either, by wiping out the religious accents. It was built under the Mughal dynasty, which is one of the most hated by Hindu nationalists, but in this case it has no connection to wars, persecutions, or forceful conversions. Try all you can, but you can’t make a symbol of violence out of it (beyond forced labor, at most). It is a symbol of love between two Muslims, while the Hindu nationalists would like to portray the Mughal rulers as lustful, disloyal, and brutal to women. And, despite maintenance issues, it is rather enduring – it’s no ruin which can be left to its final decay, after which the memory of a building can be forgotten or completely remolded. The endurance of stones, the endurance of sources, and the endurance of the more precise historical narrative should keep the likes of Oak at bay. Modern technology is not inherently Western and the East does not resist it. The Real History of Hindu-Muslim Relations Under AkbarNo, Fashion in India Has Not Become a ‘Nationalist Cause’Statue Politics: India’s Quest to Outbuild China, and ItselfTaj Mahal: A Mughal Memorial to LoveCan the BJP Do It Again?